Great Leadership: What Keeps Us From Doing What Already We Know How to do? What Keeps Us From Doing What Already We Know How to do? A nine-year old tennis student stands on the court completely astonished. Until now, this shy little girl has only been able to hit the ball over the net six times in a row. But she just made fifty-three successive, successful hits. That’s a 1000 percent or “10X” improvement. How did she do it? In the final round of the 2006 World Match Play Event, professional golfer Stephen Ames loses to Tiger Woods “nine and eight” (almost as badly as it’s possible to lose in match play). One month later, he surges six strokes ahead of his closest competitor (and fifteen strokes ahead of Tiger Woods), to win the Tournament Players Championship and take home the biggest check in golf history at the time ($1,440,000). How did he make it happen? The managing director of a multi-million design and manufacturing business in China shifts the defective product percentage from nine percent to less that one percent. The manager of a call center in a major U.S. corporation watches his unit surge from bottom performing group to second place in only two weeks. A regional manager for a training company exceeds the challenging revenue goal increase he was given, retains his company’s position with a customer who cut every other program, and doubles the company’s income from that customer—all in the midst of a very difficult economy. What is it that enables each of these “performers” to achieve such dramatic improvement? And how can the answer to that question enable you to improve not only your own performance, but also the performance of any individual or team in your organization or your entire organization? Until that day on the court as I was coaching the “10X” girl, I had believed—as most people do—that the best way to improve performance is through the “outside-in” approach. If you want to get better, read a book, take a class, or hire an expert. There’s some bit of knowledge “out there” you don’t have, and if you can just figure out how to get it, you performance will dramatically improve. But as I had begun to realize, if knowledge really were all it took to be a high performer, then all any of us would have to do would be to read that book or take that class and we’d all be winning championships. We’d all be incredible managers, great teachers, phenomenal parents and performance. But we’re not. Why? Because the biggest obstacle in performance isn’t not knowing what to do; it’s not doing what we already know. So what keeps us from doing what we know? Typically, it’s interference—or more often, interFEARence—created by those external and internal factors that slow us down, immobilize us, and keep us from performing at our best. That day on the tennis court with the 10x girl, for example, my well-intended instructions (“Shake hands with your racket.” “Hit the ball on it’s way down.” “Hit the back side of the ball) were not only not helping her; they were actually getting in the way of her performance because she was focusing on trying to remember everything I said instead of on her own experience and what was happening in the moment. 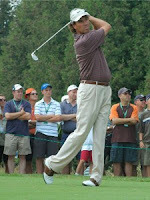 The same thing was happening with Stephen Ames at the World Match Play Event. His brother Robert, who was also his caddy, had been feeding him information on yardages, advising him on club selection and helping him read the putts. While the information was accurate and would have been useful to many players, it was unintentionally creating interference for Stephen and causing him to doubt his own instincts. In both instances, as we were able to help these athletes shift what they paid attention to and how they paid attention, the resulting performance improvement was dramatic. Using the same strategy, managers and leaders can significantly improve the performance of individuals and teams throughout their organizations. Alan Fine is the author of the book, You Already Know How To Be GREAT , world-renowned performance coach to high-profile leaders and athletes, popular trainer and speaker and also Founder/President of InsideOut Development. Considered by many to be one of the fathers of the modern executive-coaching movement, he helped develop the basic performance model known as GROW which is now a gold-standard approach used by executive coaches and organizational-design experts around the globe. Alan has spent the last 25 years as a mental performance/focus coach to top professional tennis players and golfers, musicians, and corporate executives. This is really good advice. There are so many distractions and interferences that are happening in this world all around us and all the time. It is important to weed out the interferences and focus on your own experience. I know when I used to play baseball the screaming coach never helped me to hit the baseball it was always visualizing hitting the baseball before I got into the batter's box that helped me the most. Right, I liked what Alan had to say too. He's an pretty interesting guy - he actually helped develop the "GROW" model for coaching. "...not doing what we already know." Brilliant, and true. But as you point out, how often to we encourage our employees to "do it our way" instead of trusting in their abilities that we hired them for? Great post, Dan, and thank you for bringing this important topic up for discussion. Chinese Proverb. I think this proverb highlights the problem in doing something we already know how. In addition to fear as mentioned in the article I believe the perceived level of difficulty in doing something sometimes holds people back. Could be. Thanks for the comment.